Conversation moves between the personal to the universal, the microscopic to the macroscopic, from the effect of one individual loss to a philosophical inquiry into the vastness of death and the possibility of returning to the stars. It is always fascinating to witness the discussion an image provokes. The image is a meaningful one as it lays to rest as the last portrait of my son. 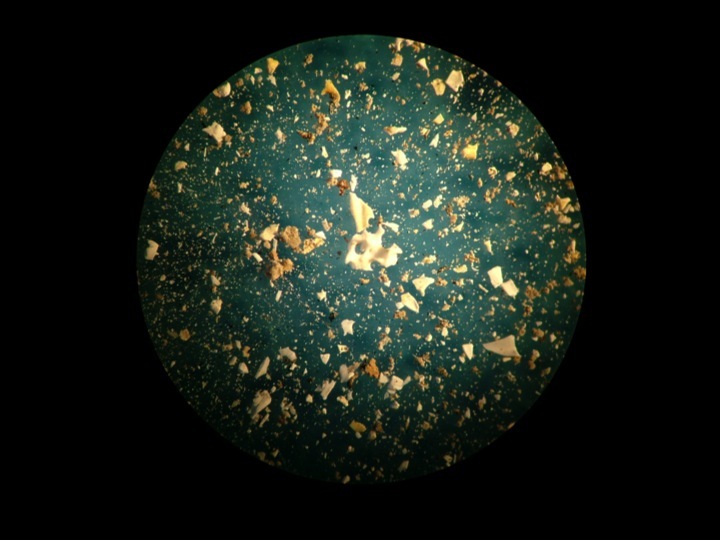 It details the obsessive need to know the last living moments of a life lost, examined up close, in microscopic detail. It is interesting to see the response an audience has to such a personal image. What do others see reflected in his last portrait? How are we affected by the personal stuff of other people’s lives? Can an image become something more, stand for something else? We discuss the act of photographing death as a contemporary taboo. In hindsight I wish I had felt able to photograph my son at the time of his accident and in the days that followed. I wonder whether the act of photography enables you to stay witnessing an experience, to be present, to digest, to give shape to something that it too much to bear with the naked eye? Perhaps it gives you agency in the face of such powerlessness and devastating loss? As an artist and a mother my deepest instinct was to photograph my son. What is it that leads us as artists to want to recall the events of our lives through photography, painting, video, sculpture, performance, re-examining them from different angles? I wanted to bear witness from behind the lens of the camera. I felt the lens had the power protect, creating a screen from which to observe the contours of the body with distance. But the post mortem photograph has become a taboo considered morbid and macabre. Why is this? It felt wrong and secretive as though I would be betraying the trust of my family and friends. They were used to my art practice but not in this context. I behaved according to what I felt was socially acceptable. Why does death no longer shares a space with the living? The lens of a microscope acted like that of a camera. I was able to confront the uncomfortable, to bare witness from a distance. I wanted to see into and beyond his death. I saw a future through the microscope that day. Following death, certain aspects of the other person’s life come sharply into focus. I wanted to know all the facts, examine them, and draw them up into my consciousness. All the last details, the last food that was eaten, the last conversation, the last clothes worn, the last objects touched, the last people seen, the last journey made, the last breaths taken. In the early days of grief the details of the other’s life is scrutinized, drawn into microscopic focus, imagined and re imagined. With telescopic vision nothing else is allowed in. Words are not enough to communicate what is felt following death. A photograph can be passed on and witnessed by another, in silence. Empathy and shared experience passed between each other without words. The image speaks without words in a profound and intimate way revealing what we sometimes close our eyes to. “When he shall die, take him and cut him out in little stars, and he will make the face of heaven so fine that all the world will be in love with night and pay no attention to the garish sun.” Romeo and Juliet, Shakespeare.